Who knew dorm essentials could be so unbelievably comfy! Start your college life and your college dorm checklist out right with college supplies that offer superior comfort- dorm bedding, dorm rugs and our Abstract Ikat Dorm Snoozies! 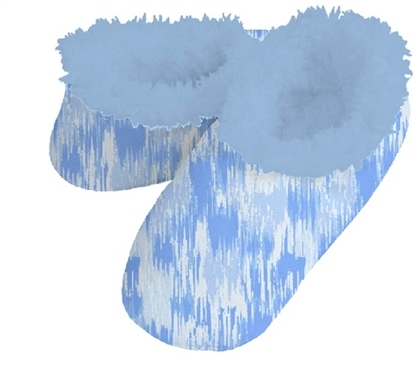 You may have not considered adding dorm slippers to your college dorm checklist, but they are a dorm necessity, especially when they are this comfy! Your dorm bedding and dorm rug are going to be super comfy and warm. When you wake up in the morning, you're not going to want to leave the comfort of your dorm bed to step on the cold dorm linoleum. That's where our Abstract Ikat Dorm Snoozies come in! With a pretty blue pattern and made with a brushed fleece exterior and soft Sherpa interior, you will want our Dorm Snoozies by your dorm bed at all times! When you wake up in the morning, you already don't want to leave your dorm bedding. You will dread it even more when you think of the cold linoleum awaiting you in the space beyond your dorm rug. With Dorm Snoozies by your side, you can simply slip them on and avoid the harsh cold dorm floor! You will find yourself wearing our super comfy Dorm Snoozies not just in the morning, but after class to relax, too!